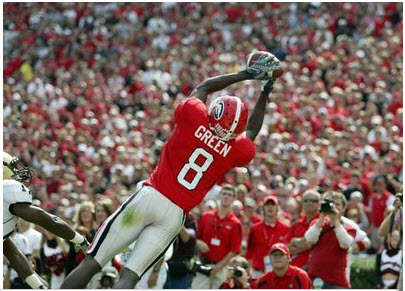 Green is one of the finest receiver prospects in the last few years. Has the ideal length, refined route-running skills, hands, and big-play ability to become one of the league’s top players at the position. Displays tremendous acceleration and fluidity for a taller player. Is a consistent vertical threat because of his outstanding combination of deep speed, height, ball skills and leaping ability. Very productive underneath gaining separation or catching the ball in a crowd. Occasionally has difficulty with bigger, more physical defensive backs and would like to see more attitude when run blocking. Was suspended once by NCAA but character appears to be solid. Green likely will go in the top 10, perhaps top five.